disons que je n'ai jamais pu les voir parce que mes exemplaire consécutifs sont partis chez des clients lolll du coup les cordonniers sont les plus mal chaussés. dans ce coffrage les écrans sont sur-suremballés, coffrage sur mesure tout en bois, ca ne risque pas de casser dedans, déjà en sent que le soin est présent meme sur la protection de l'écran. je vous prepare une vidéo dans la soirée que j'ai prise il y a 10 minutes qui montre la lusoscreen contre une autre toile a gain déjà très bonne, dans un environnement très très lumineux sur le coté droit qui est en pleine exposition, le rayonnement très important à l'heure ou est prise al vidéo donne directement sur les 2 toiles. c'est pour moi le meilleur test possible et le plus démonstratif. Merci Yann pour ces deux vidéos. Greg en avait déjà fait la démonstration et pour y avoir assisté. Déjà dis et redis, cet écran est une tuerie et le résultat est tout simplement sans appel. J'adoooooore, et si vous aimez la 3D alors là c'est tout simplement exceptionnel. Hello to everyone. My name is Paulo and I work with my dad in Lusoscreen. First and foremost, I'd like to thank everyone, specially Mr. Gregory for shining a spotlight on the work we do. After seeing what the screen could do, he had the courage to defend it against other interests (people that didn't even see the product working) that even went so far as questioning his reputation. We are very thankful, since the norm is for big companies to try and make us disappear. Fortunately on the other side of the coin, our customers always defend us and it's them that give us the will to keep pressing forward. If you allow me, since I'm here speaking on behalf of Lusoscreen, I'd like to give you a few tips on how to easily make this screen model work for you, as well as present the main reasons for the specifications we chose for it. I must do it either in English or Portuguese, because while we can understand the written French language (except for the odd word every now and then, that we feed Google for it to translate), writing it correctly is much harder. Also, I am only able to log into the forum sporadically, since we usually have a lot of work in our hands (we were unable to enjoy any holidays and even today, Saturday, we are here working). hi Paulo, surprised to see you here and very happy in the same time. Thank you for your friendly welcome. And good afternoon everyone! Let me start with a little bit of history to explain why the Lusoscreen Home-Cinema Standard was created. After several customers purchased our High-Gain screens to use for home cinema (not the intended use for those screens, but some people liked it), we decided it was time to create a screen model that would cater to the needs of that specific audience. We noticed that most people, specially housewives, didn't like to see "crates" hanging from the ceiling (the FullHD HC projectors tend to be large). Sanyo's Z2000 and Z3000 as well as Epson's TW3200 and 9100 have sold well in Portugal, not just because they were good but also because they had a zoom function that allowed them to be placed at the other end of the room. Taking as reference the most common room dimensions in Portugal (5x4m, 6x3m, 6x4m, etc...) the Lusoscreen Home-Cinema Standard was optimized to be placed at a distance between 4 and 6 meters from the projector (this has nothing to do with the position of the audience, they can be closer if they need to). For shorter distances, some experience is needed to correctly place it. It may be preferable to choose a different screen model (that we expect to make available soon). After placing the projector and the screen in their proper places, you need to orient the screen to direct the projected image to the audience. The supports are prepared to let you do that with a minimum of effort. Turn on the projector and set the image to a uniform color (many projectors default to a blue color when they have no signal, this is good enough). Next, tilt the screen up or down until the audience (usually sitting on the couch) sees that the image has the same brightness on the top and on the bottom of the screen. When you find the correct tilt, tighten the black knobs on the supports to fix the screen in place. After that, grab some popcorn and enjoy your movie! One last thing of note, all light sources behind the projector (windows, lamps, etc...) will degrade the image quality. Windows and other light sources on the sides or behind the screen will interfere much, much less. At the next opportunity, I will give you some more advice to optimize your home cinema experience with our screens. i will be very interest in the coating of your screen. Do you have a special coating in comparison with other manufactory´s? If yes, can you tell more about your coating? what (center) gain of your screen? As I said in my first message, I can only stop by every once in a while. xtrady, my dad decides how the screens are made, we use several different manufacturing processes. One of them is the polarization of particles during vaccum-deposition. I'm sure that these processes may have numerous other applications in other fields so we keep some discretion. Greg, we had the intention to start testing at least one new screen model in August. However, we got crushed by an avalanche of requests for glass-less mirrors. Not only did we not enjoy the 3 day holidays we intended to , but we also had to start working overtime to be able to answer as much as we could. We had already begun to update our webpage but even that is still unfinished. I hope to be able to give you good news soon. And since I'm here, let me ask for your opinion: what would be preferable? A screen similar to the one you know, but with more gain for the people who want to use it like a television (with windows open and lights on) or with less gain but wider viewing angle? Here's another tip about screen placement. When we project images in a flat screen with the projector fixed in the ceiling, and then move the screen from position A to position B, the top of the image maintains it's relative position, but the bottom of the image recedes almost to the middle of the screen. So, for the same zoom level of the projector, a screen that is close to the projector has a smaller image than a screen farther away from it. 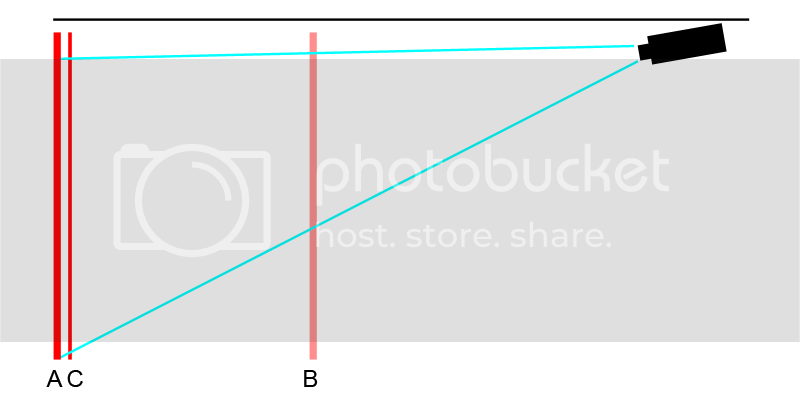 When we use a curved screen (any screen of any brand, not just ours) the sides of the screen (position C) are closer to the projector than the center (position A). Because of this, the bottom of the projected image will make a small curve, which will be more noticeable the closer the projector is to the screen. The curve of the screen doesn't affect the image focus, except when using short-throw projectors, but those can only be used with screens that are really flat and really smooth (if someone needs, I can explain why). With the projector placed at least 4 meters away, this curve almost disappears. If some of it remains, you can hide it inside the velvet we place all around the screen. On the other hand, if you lower the projector a little (or a lot, as long as the light still passes above people's heads) at some point the lines will be straight. Another topic for the future: when you use a flat screen, the ratio of the projected image (let's say it is 16:9) is only real if you place the projector in a specific place of your living room. If you have the projector in the ceiling and you move it toward the screen (or away from the screen) while keeping the screen in the same place, the ratio of the image changes. If the intention is to fill the screen completely then it is not a good idea to use borderless screens, unless you have a way of placing your projector exactly in the correct place. I'll find some images to explain this when I can.